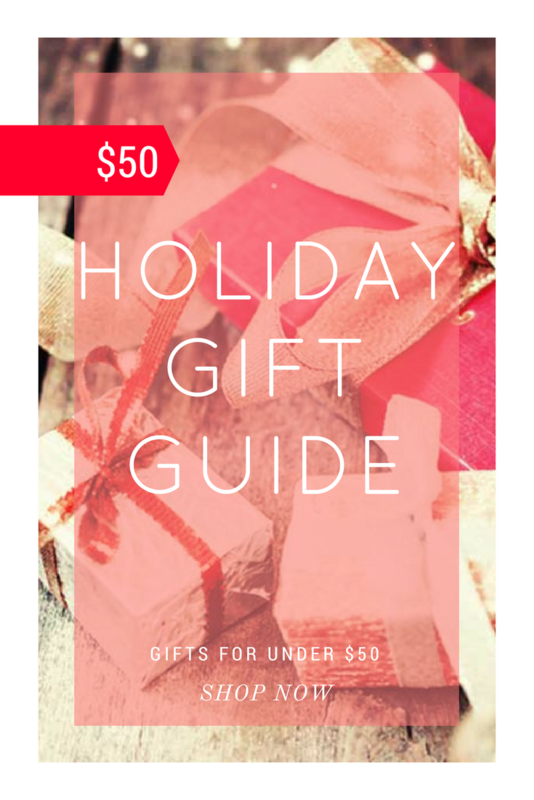 My holiday gift guide 2017 for $50 or less is now here! Every single item seen here is under $50. I’ve rounded up the best holiday deals that won’t break the bank. A few of my favorites are 1) Joy Mangano My Little Steamer Deluxe – it’s always something I use as a blogger and when you open a package full of new clothes they are generally wrinkly. Steamers take out those wrinkles in less than 5 mins! This one here is only 29.99! 2) Another one of my favorites is this Ban.do portable phone charger. I love the pastel pink design with the rose detail on it. It’s seriously so cute and such an essential thing to own in this busy tech world we live in. 3) Lastly, my favorite is this cozy Fine Knit Cardigan from H&M for $29.99. I love the beige color, and it just looks so cozy! It also comes in grey. This post contains affiliate links that keep Stop, Drop & Vogue running, which means I make commission from the retailer if you purchase or click a product – so click away and happy shopping ? I love the cardigan from H&M. I like big warm cardigans like that, plus the price is great! I totally dig the Fine Knit Cardigan! My daughter or my niece would like it. And, it’s affordable! I could really use one of those cardigans right now! It is so cold in my end of PA. Definitely checking some of these out for gifts. Absolutely love this post. I might have to pick up all of these gifts for myself. It is great to have some new options with the holidays coming up. All are adorable, but I especially I love those tassel earrings! Such wonderful picks for the holidays, I’m sure whoever is on the receiving end of these gifts would be over the moon. I know I see a few things that I would love! So many great ideas! I am ALMOST done two of my friends so this is really helpful as a couple items here would be perfect for my friend in Nebraska! That embellished bag is gorgeous and I love those earrings! These are such great ideas! I love that they also do not break the budget and look so fabulous. Love the tassel earrings and that sparkly phone case! Great gift ideas at this price point. I really like the scarf and sunglasses. I’m all about blush tones this year so those are right up my ally. I love those initial necklaces! Thanks for sharing. I always wish that I had people who wanted this type of things because it be so much more fun for me to shop for. Maybe I’ll have to shop for myself. That blanket scarf is just beautiful! I would love one for myself LOL!!! I love gifts that are this nice under $50! These sunglasses are so fabulous! This is absolutely the best gift guide I’ve seen so far. So many great and UNIQUE products! Love the different options and how they’re all under $50! Ooh that scarf looks so cozy! Great budget friendly roundup! This is such a good gift guide! I see a couple of things on here I’d like to find under my tree. The black and white bag and tassel earrings are giving me life! Beautiful gift ideas. I think I would like to put these on my wish list. I too have started a gift list for others and trying to keep the budget VERY low. Under $50 is perfect. Thanks for sharing. These are great picks! I love the initial mugs and that leopard clutch! The tassel earrings are so cute and so is that pink scarf and chunky knit sweater. I always struggle to find gifts under $50, these picks are so great! Love the sunnies! Might need to treat myself! ? The DIFF sunnies are my favorite!! I’m totally a candle type of gal! Love a good candle! Great gift guide! So many great gift ideas!! Baublebar is doing the most amazing holiday sets this year, I can’t even stand it! So many great gift ideas!! I love the tassel earrings, Baublebar is doing so many amazing holiday sets this year, I can’t even stand it!